I was this morning at the Naturkundemuseum in Berlin, and I admired once again the skull of the T-rex Tristan Otto. It was displayed under a set of lights that made a fascinating play of light and shadows on the dark fossilised bones. While I was drawing, many people of all ages ran to the display and stood in awe, observed it from different angles, took pictures, then moved forward for the visit. It is definitely a magnificient finding from a scientific viewpoint, as well as a visually appealing object. My mind first identified as a dinosaur skull, therefore as the remain of an animal who lived millions of years ago, when the Earth looked much different, there was no man, but the oceans and trees and reptiles and insects and all life, and the moon and sun above; but with time, while drawing, I started to see it as a sculpture, as a piece of art, as a monument to the exquisite art of chiseling, glorified by light – up to the extreme of flattening it onto paper, as an interesting set of shapes, lines, angles, proportions – abstract, essential, distilled. These two viewpoints are valid for any other specimen in the exhibition, and for me, for everything I can see. I sometimes stop and marvel over an accidental composition on my way home, or a ray of light. I went to the museum to see Tristan Otto, and I enjoyed the whole visit, but did I enjoy it only because it was carefully organised, cleverly connected, and artfully displayed, or because it had value in itself? Did I admire the most colourful animals because they are artistically pleasant? They did not come to life with the purpose to be ambassadors of the beauty of wildlife, but they can still be considered as such: through their beauty, they can awaken our admiration and make us want to protect them from threats and extinction. I feel a bit uneasy with this thought, however, because I’m afraid that what is not beautiful, or not attractively presented, does not get that much attention. I understand that attractive presentation is an essential feature of many human creations and activities, but I feel uneasy applying it to everything, especially to what has no power in improving its appearance. 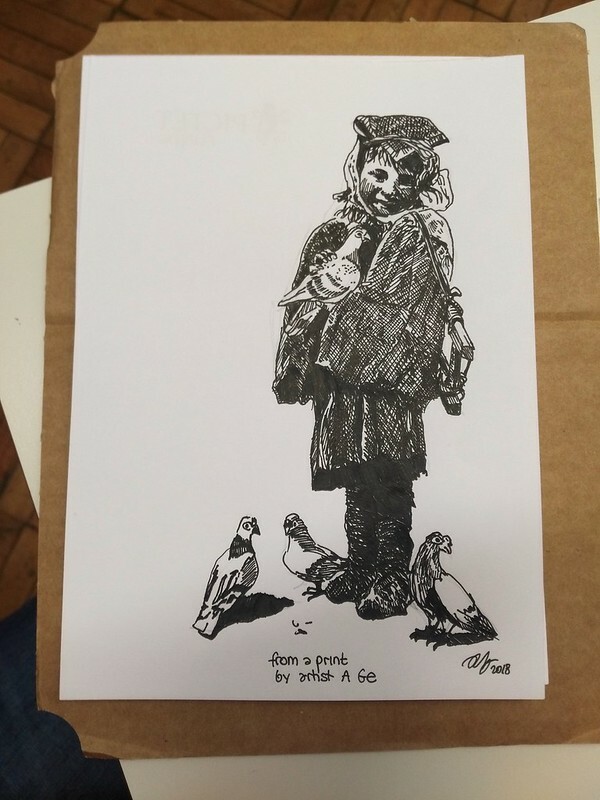 I like it, even if the pen I used was rather large, and many details were lost in copying. I took half of the total time to sketch the proportions with a pencil, and I am satisfied with the result 🙂 It is true that when I switched to the black pen, my focus was on details, so I had to rely blindly on the pencil lines. Any comments on how to experiment further? I’d love to hear from you! Today I watched John Muir Law’s workshop about gesture sketching, that focused on the preparation phase of a drawing: getting proportions right, identifying useful reference lines, blocking shapes, all before diving into details. It put together a lot of tips and gave many occasions to test these by copying from pictures. It is quite useful to learn to put the sketch together rather quickly, for the cases when the subject is an animal that moves fast. Last weekend I visited my family and took some time to doodle. 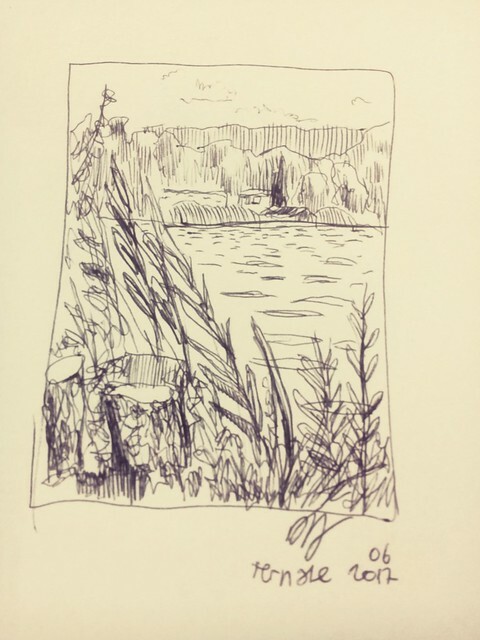 I made a landscapeito of the lake we went to for the afternoon: I decided to limit the time to 5 minutes, so that I focused on getting the framing, shading and details right. In this drawing, I tried to make the background lighter than the foreground, a way of suggesting distance. I am not super happy with the water, but I think that I captured the essence of the scene. My mum is currently practising guitar together with her colleague Biagio, so they invited me to their rehearsal. It was a perfect occasion to draw! I took around half an hour to make the drawing below. It was easier to draw the parts of the body that didn’t move much (right arm, shoulders), but hard to draw the head and the left hand, that moved a lot. For these parts I chose a particular position and waited for them to show it, drew a couple lines or hatching, and wait for next occasion. 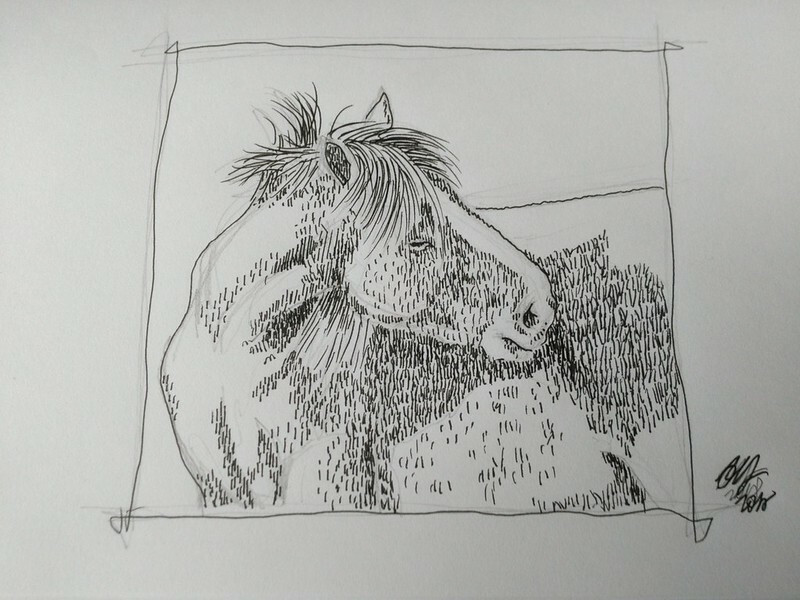 I learned about this technique from a workshop about wildlife sketches, where you choose several postures of an animal and work in parallel, adding details to each doodle every time the animal falls into that position. It is indeed a valid technique for any moving subject. I feel I’m living with a tiger. She controls me when I’m alone. She waits for everyone to leave, then she attacks. That’s why I try to be with friends, but it feels like they are my hostages. When they are there, she lays down in a corner, and I feel almost normal. But sometimes she attacks them too, and I feel that I put my friends in danger, while trying to protect myself. Therefore I stay alone more often. When I sleep, she sleeps. She usually likes listening to music. Some things that look great to others sometimes annoy her a lot. She’s quite unpredictable. That would be OK if she weren’t so strong and dangerous. I don’t want to spend the rest of my life trying to distract her enough to have a few minutes alone. I don’t want her to be in control.